of State for Northern Ireland. London today by British Prime Minister David Cameron. Hertfordshire and Finchley in north London, since 2005.
of State for Transport in 2010. Rural Affairs, will be strongly applauded. the policy of criminalisation of political prisoners. highly unpopular figure across a range of political opinion in Ireland. 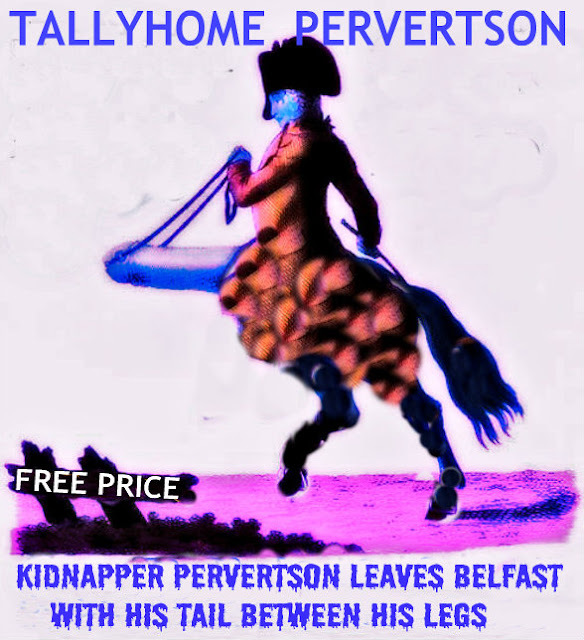 unpopular Northern Ireland post for over two years. Circus/Denmark Street area of Belfast. cannon and fired six baton rounds against rioters. Twenty-six police officers were injured in sectarian rioting between loyalist and republican gangs in north Belfast, and the violence was continuing into the night. At one stage riot police in the lower Antrim Road/Carlisle Circus area had to simultaneously repel attacks from both sides. Petrol bombs, fireworks, golf balls and bottles were thrown at police lines, as the Police Service ofNorthern Ireland responded with water cannon. At least three officers were taken to hospital. There were also unconfirmed reports of baton rounds being fired. The disorder erupted following a republican parade which passed Clinton Street Orange Hall on Sunday afternoon. The Republican Network for Unity, the anti-Sinn Féin group that organised the march, said the 300-strong parade came under attack from loyalists. Among the injured were women and children, RNU alleged. 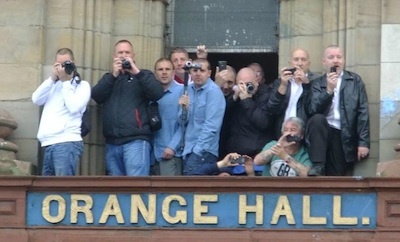 The Orange Order claimed the trouble began after Clifton Street Orange Hall was attacked by republicans. The Order said the attack appeared to be "premeditated". A number of arrests have been made. As well as missiles and molotov cocktails, the loyalists from the edge of the Lower Shankill estate drove burning wheelie bins against police lines. Police used water cannon to counter the threat from the blazing bins. It appeared that all the police casualties were due to loyalist violence in and around Denmark Street, the main entry point into the Lower Shankill estate. The violent scenes were witnessed by terrified residents of an old people's home facing Carlisle Circus. Motorists were advised to avoid the Carlisle Circus/Antrim Road area last night. A heavy security presence remained in the area overnight, with a police helicopter hovering overhead and dozens of heavily armed officers on the streets. Tensions have been high in Belfast's north inner city since last weekend when seven police officers were injured trying to keep rival loyalist and republican factions apart. That trouble broke out after loyalist marching bands defied a legal ban on them playing sectarian songs outside St Patrick's chapel, one of Belfast's oldest Catholic churches. 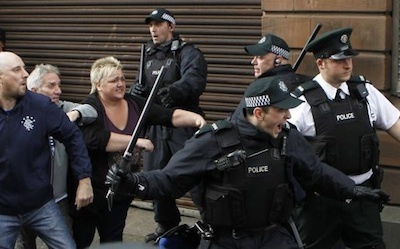 Nationalist residents, outraged over the bands' behaviour, got involved in scuffles with loyalist supporters. Since then the atmosphere in north Belfast has been poisonous, with both sides blaming each other. The area around the church has become the latest battleground in the Ulster loyalist marching dispute. Belfast Sinn Féin councillor Fra McCann said a Catholic home close the so-called peace line separating the republican Falls Road from the loyalist Shankill had been attacked with petrol bombs as the violence appeared to spread. Even if the current violence subsides, there are fears of further trouble in north Belfast later this month. Thousands of Orangemen and loyalists are expected to march past St Patrick's on 29 September as they commemorate the 100th anniversary of the Ulster Covenant, the pledge by hundreds of thousands of unionists in 1912 to oppose Home Rule. Two senior Protestant clergymen branded the actions of loyalist bands outside a Catholic Church during the march by the Orange Order’s senior organisation as “blatantly sectarian”. Their statements mark a significant break between the Protestant churches and the loyal orders over sectarian parades in the north of Ireland. Fighting broke out and a full-scale riot was narrowly averted when loyalist marchers and the PSNI police jointly ignored a ruling of the Parades Commission through north central Belfast last weekend. The PSNI made no effort to prevent the highly controversial Young Conway Volunteers (YCV) flute band from parading past St. Patrick’s Catholic church at the corner of Carrick Hill and Donegall Street -- contrary to the determination of the Commission, which is supposed to be legally binding. The YCV and other bands engaged in a number of deliberately offensive and sectarian acts outside the church, to cheers from thousands of loyalists who had gathered nearby. 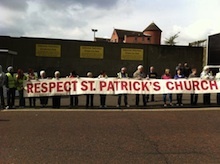 Members of the bands and their supporters roared sectarian abuse at the church and local Catholics. Bandsmen not only defied the Parades Commission ruling to play only a single drum beat passing the church, but instead played even louder with several playing ‘The Sash’ at the doors of St Patrick’s. The Shankill Road band had previously signalled its intention to ignore the determination, issuing messages that they would “walk and play”. It had been banned from walking down part of Clifton Street and Donegall Street after it played the sectarian Famine Song (while marching in circles outside St Patrick’s Church) during the Twelfth of July events. Nationalist residents from Carrick Hill had a banner calling on the loyalists to ‘Respect St Patrick’s’ ripped out of their hands, before the loyalist mob surged forward and hand-to-hand fighting broke out. Presbyterian moderator, the Rev Roy Patton and Church ofIreland primate ArchbishopAlan Harper described the behaviour of some of those involved in the parade as “unacceptable”. “I think we would be very clear as a Church that such behaviour is totally unacceptable and is not in keeping with the values that the loyal orders espouse,” Mr Patton said. “As a Church we deem such behaviour to be unacceptable. Archbishop Harper saidthere was “no defence” for the actions. “We recognise that people have particular issues, perhaps with the Parades Commission, but this is not the way to deal with them andsuch behaviour is inconsistent with any profession of Christian faith,” he said. Whether or not the action were in defiance of the Parades Commission, the outcome was “blatantly sectarian”, he said. “We’ve spent a long time examining sectarianism within our own Church and we are very clear that sort of thing is not acceptable and is no way to build a harmonious society. Ultra hardliner unionist Jim Allister of the TUV launched a stinging attack on the two churchmen. They should not “attack the Loyal Orders for doing something which they have done for generations without any problems arising,” he said. But the SDLP’s Alban Maginness welcomed the leadership shown by the Protestant church leaders. PSNI ‘MUST EXPLAIN’As reaction continued to Saturday’s events, the Catholic bishop Noel Treanor this week called on the PSNI to explain why “no visible effort” was made to prevent loyalist bands from defying Parades Commission rulings during Saturday’s Royal Black Institution parade. He also criticised an open letter signed by several high-profile unionists, including First Minister Peter Robinson, which warned of trouble ahead of the parade and called for the scrapping of the Parades Commission. Meanwhile, Carrick Hill residents were praised for standing up to the sectarian actions of the loyalist bandsmen by their parish priest, FrMichael Sheehan of St. Patrick’s. He spoke of his shock at the bandsmen’s behaviour but said he was “proud, elated and encouraged” by those “who stood tall in the midst of such dreadful sectarian hatred and venom”. More than 20,000 participants from the Orange Order, Apprentice Boys and Royal Black Preceptory, along with 100 bands and several thousand supporters, will take part in the march on September 29 to mark the centenary of the signing of the Ulster Covenant, a unionist pact to oppose Irish independence. Members of the Parade Commissioners have already met residents of Carrick Hill to hear their concerns about another contentious parade in the area. SDLP assembly member for North Belfast Alban Maginness said the behaviour of bandsmen and their supporters on Saturday was “grotesquely triumphalist” and among the worst he had seen in years. He called on DUP Minister Neslon McCausland to condemn those who defied the Parades Commission. Mr McCausland was among the signatories of an open letter to British Direct Ruler Owen Paterson, on the morning of the parade, warning there might be trouble and calling for theParades Commission to be scrapped. He was also among a number of unionist politicians who were among the supporters during the march past the church. “The onus is on him as a Stormont minister, a representative for North Belfast and a senior member of the DUP,” Mr Maginness said. 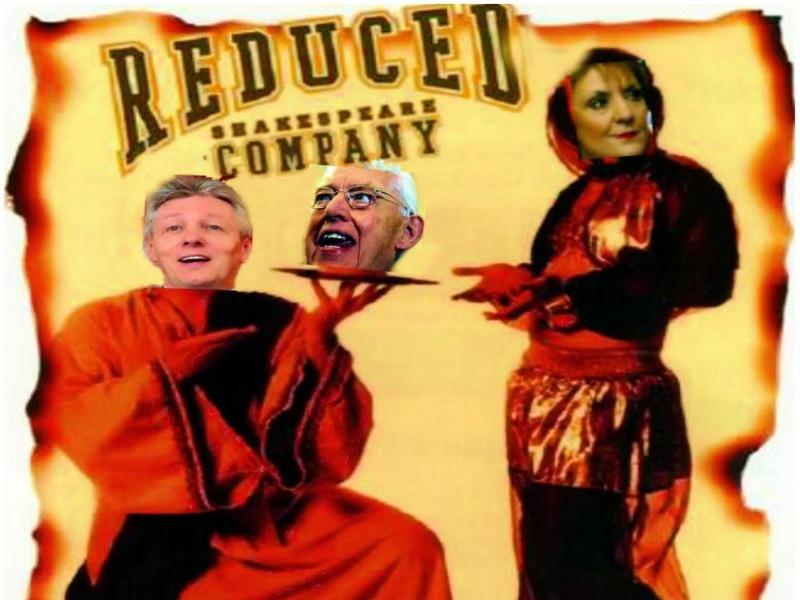 But the hardline DUP figure rejected this. “After a summer of bizarre decisions by the [parades] commission, there was an anger within the unionist community and this was almost inevitable”, he said. Sinn Féin West Belfast MP Paul Maskey said the DUP’s failure to condemn those involved showed “a lack of political leadership”. “The problem for [DUP Ministers] Nigel Dodds and Nelson McCausland is clear -- the cameras in Donegall Street on Saturday showed exactly what happened,” he said. “They showed hundreds of incidents of law-breaking. 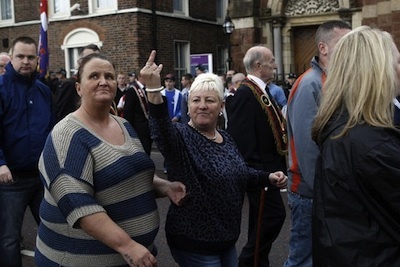 They showed unionist politicians being part of that parade. Mr Maskey said there must be a “robust PSNI investigation” into breaches of the commission’s determination. Local Sinn Féin Assembly member Caral Ni Chuilin went further, calling on the unionist politicians who were present to identify the hundreds of loyalists who broke the law on Saturday. “All unionist politicians present at Saturday’s parade, particularly those that are members of the loyal orders, should make a clear statement of their intent to cooperate with the PSNI investigation into those that broke the law outside St Patrick’s Church,” she said. The North’c culture minister expressed anger that people who are “not dissidents” had been targeted by the loyalists, and said a solution needed to be found. Carrick Hill residents’ spokesman Frank Dempsey said they had been assured on Saturday morning “that the Young Conway Volunteers would be rerouted and not allowed to pass the church and yet they did without any attempt made to divert them. “What is the point of placing restrictions and determination on parades if they are ignored and then not enforced? “The residents of Carrick Hill have been treated very badly. A commemoration for the Protestant republican Henry Joy McCracken, the founder of the United Irishmen, was attacked by a loyalist mob this evening, triggering a wave of rioting in north Belfast. It was the second time the annual event, organised by the Republican Network for Unity (RNU) has been held. Last weekend, the PSNI police ignored a decision of the Parades Commission ordering loyalist bands not to engaging in sectarian provocation outside the Catholic St Patrick’s church, near the nationalist Carrickhill area. A protest by nationalist residents was attacked by loyalists amid ugly scenes which have fuelled tensions throughout the week. The commemoration this evening passed through the nationalist New Lodge and North Queen Street areas, before continuing past Carrickhill to Clifton Street cemetery, where the Irish patriot is buried. While walking to the cemetery, participants came under a sustained attack from loyalists, including well known figures from within the paramilitary UVF, who had gathered from early morning. Marchers were showered with a barrage of bricks, stones, golf balls and bottles. Several were badly injured, including children. Inexplicably, the PSNI had allowed the loyalist mob to gather within metres of the agreed route, ensuring that an outbreak of violence was inevitable. The RNU said only the efforts of its stewards prevented large-scale hand-to-hand fighting after the mob were able to enter an apartment complex beside the Clifton Street cemetery. Throughout the ceremony, loyalists continued to attack those gathered and at one stage managed to scale the walls. At one point, a small child who was carrying a wreath was injured by a missile. The RNU blamed DUP Minister Nelson McCausland for bringing negative publicity to the McCracken commemoration in comments he posted on the internet during the week. “RNU state categorically that we were not to blame for today’s trouble; we are an anti-sectarian organisation and were on our way to honour a fine protestant Republican when we were attacked. Local nationalist youths became involved in sporadic clashes which have deteriorated into full-scale rioting tonight. Trouble is continuing at the Carlisle Circus and Clifton St areas. The PSNI has deployed water-cannon to the area, but notably did not manage to prevent loyalists attacking a nursing home for old age pensioners at Carlisle Circus. Sinn Fein Assembly member Fra McCann said a petrol-bomb attack on the home of a Catholic family earlier this evening was also linked to the trouble. An Orange Hall in north Belfast was also reported to have been vandalised during the disturbances. Trouble broke out in Belfast city centre this afternoon after a loyalist band was permitted to march up to a Catholic church to the same spot where it had conducted a provocative sectarian ritual last month. The clashes broke out during the annual marches of the anti-Catholic Orange Order’s ‘senior’ organisation, the Royal Black Preceptory. The decision by the PSNI to allow the controversial Young Conway Volunteers (YCV) band to march up to St Patrick’s Church on Donegall Street ran contrary to a recent ruling of the Parades Commission. The commission had ordered that the parade past the church not include the band, said to have links to the unionist paramilitary UVF (Ulster Volunteer Force). The YCV band became internationally notorious last month after it was filmed circling outside the same church as part of a ritualistic insult to Irish Catholics and Ireland’s famine victims. That incident took place on July 12, during the biggest day of the Protestant marching season, when the Orange Order holds hundreds of marches to commemorate a 17th century battle victory over Catholics. This afternoon, the PSNI ignored a determination of the Parades Commission which had prohibited the band from again marching past the same church. A number of other so-called ‘kick the Pope’ loyalist bands also engaged in provocative acts outside the church and played sectarian tunes between Clifton Street and Unity Street, a further breach of the commission’s supposedly legally-binding rulings. Hand-to-hand fighting later erupted between a loyalist mob, which had gathered to help defy the Parades Commission ruling, and nationalist protestors from the local Carrick Hill community. The PSNI also clubbed and assaulted the Carrick Hill residents, some of whom held up a sign reading ‘Respect St. Patrick’s Church’ before coming under attack. Sinn Fein’s Caral Ni Chuilin called on unionist MP Nigel Dodds to make a clear statement condemning the breaches by loyalist bands during the parade. “The situation arose this morning because of blatant sectarian and provocative behaviour by a loyalist band outside St Patrick’s Church in July,” she said. “The determination set by the Parades Commission was not adhered to today and we had a situation where there was a continuous stream of sectarian displays outside the church by the bands involved. “Local MP Nigel Dodds now needs to come out and make a clear statement condemning these breaches of the determination and law breaking. 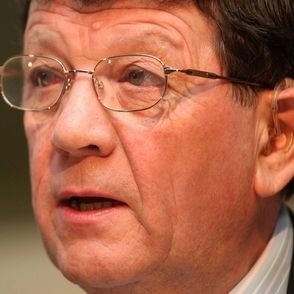 It has emerged that Sinn Féin MP Pat Doherty has lobbied for money for a ‘kick-the-Pope’ loyalist flute band in Castlederg, County Tyrone, as has a fellow Sinn Féin councillor. The news has stunned the nationalist village, where the Castlederg Young Loyalist Flute Band has taken part in a number of contentious sectarian parades. The band is linked to a lodge within the anti-Catholic Orange Order, while its repertoire includes songs which glorify UVF killers. Mr Doherty wrote to the Arts Council backing funding for the band to the tune of five thousands pounds -- which the band itself was unaware of. The documentation uncovered by the BBC also revealed a Sinn Féin councillor’s backing for funding for another loyalist band in Tyrone. Cookstown councillor Ciaran McElhone wrote to the Arts Council last October after Drumnacross flute band was denied funding. Separately, the rival nationalist SDLP has been shamed by its failure to oppose a motion at Lisburn council calling for the Orange Order to be granted the freedom of the city. The SDLP’s failure to turn up for the vote allowed the motion to clear its first hurdle -- but they later issued a statement claiming to oppose the motion “at all stages of council”. Sinn Féin Lisburn City Councillor David Bell said the statement was “a face saving exercise”. “This is a lazy way to conduct politics and in no way passes for real representation,” he said.